Do you have photos, videos or other important files that you'd like to preserve for 50 years, 100 years, or longer? Yesterday I was looking at a photo of my great-great-grandparents, which was taken in about 1870. I scanned it and saved a digital copy on my computer's hard drive, then copied it and some other family photos to a CDROM disc. But neither of those digital copies is likely to survive as long as that 150-year-old original photo has. Standard CD/DVD technology uses a laser beam to heat a layer of organic dye that is sandwiched between polycarbonate sheets. The heated point, which can be very tiny, first swells like a bubble and finally collapses into a pit in the dye layer. A pattern of pit/no-pit areas on the disc’s surface constitute binary code that can be read by the same laser that wrote it. That is, the pattern can be read as long as the laser-burnt pits last. It takes 3-5 years for the organic dye to degrade naturally; that is the maximum life expectancy of CD, DVD, or Blu-Ray discs that use dye technology. Milleniata claims to vastly exceed this life expectancy by replacing degradable organic dye with an immutable mineral compound that is melted by the writing laser beam. For $8 a month, M-DISC will pull content you've stored in a Google Photos account, and send you an archive disc that should last for hundreds of years. You can also burn your own M-DISCs at home, with a compatible DVD or Blu-ray drive. All DVD drives are capable of reading the M-Disc DVD, but it takes more power to melt “stone” than it does to boil dye. Not every optical drive contains a laser powerful enough to write M-DISC discs. LG Electronics, Samsung, Hitachi, and Pioneer offer optical drives touted as M-ready. And they don’t seem to be any more expensive than regular drives. The LG Electronics Ultra Slim DVD Writer is an internal drive that sells for $32 on Amazon. The external LG Electronics Blu-ray DVD Writer goes for $149. You can find dozens of other M-DISC-compatible drives here. The mineral compound makes M-DISC discs longer-lived, but it does not make them indestructible as the many preposterous demonstrations conducted by Millienata suggest. I don’t care if an M-DISC baked in lasagna remains readable. How does it do after I drop it face down on a sidewalk and step on it? M-DISC’s added value lies in its stability under archival conditions: a safe deposit box, or perhaps an attic or basement. Attics may get hot enough to degrade organic dye prematurely while minerals remain intact. But a disc made with either is still vulnerable to physical destruction if it’s carried from place to place routinely. Still, for important personal or commercial digital artifacts such as family photos, tax returns, unpublished novels, etc., at least one M-DISC may be worth having. The largest Blu-ray M-DISC capacity is about 100 GB, so more than a handful shouldn’t be necessary for most consumers, unless you have extensive collections of photos, music or videos that you want to preserve for 1000 years. 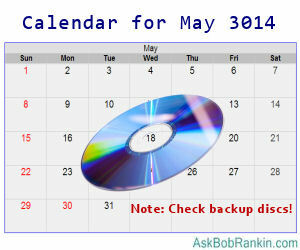 Businesses and other institutional users may need more M-DISCs. A 5-pack of 50GB M-DISCs costs $47 at the M-Disc Store. You can also purchase M-DISC compatible drives and discs in other quantities or capacities there. M-DISCs are pricey compared to regular DVD or Blu-ray discs, but if you're looking for a backup solution that avoids the problem of the relatively short lifespan of consumer-grade hard drives and CD/DVD discs, as well as the privacy concerns of cloud storage, a couple of M-DISCs and a fireproof safe bolted to a concrete floor might be the best you can do right now. I'll bet Mel Brooks and Carl Reiner have already gotten theirs. Most recent comments on "Will Your Photos Last a Thousand Years?" About two years ago I purchased an LG DVD writer that clearly stated on the box that it was M-Disk capable. I then went to the sales staff & even the tech dept and asked them if they sold M-Disks. NO One had any idea what I was talking about. It was only after I showed them the DVD writer box that they believed that such a thing existed, and I wasn't just a middle aged idiot. Of course the large electronics store did NOT have any M-Disks. I am glad that you refreshed this topic as I was concerned that these might have faded away. Bob, thanks for the good information (as usual). How does CD storage compare with the expected longevity of cloud server storage -- such as used by Google Drive? How long will a usb flash drive last? Mitsui claims their gold CDs/DVDs will last 100 years or more. Is this true? Like Bill, I have DVDs and even older CDs (including my first burned CD-R) that have lasted 20+ years. In fact, the *only* optical disks that I've had go bad are those that have been physically mis-treated, either by scratches or exposed to excessive heat or sunlight. So don't do that! "Standard CD and DVD discs have an expected lifespan of just 3 to 5 years" sounds like something from a advertisement for M-disk. What may be more important is the file *format* used, I don't think many things can read all my old WordStar files! I'd guess that JPGs and PDFs will be around much longer than .wpd or .wps files. And don't forget about a reader, do you still have a drive that can read that 5-1/4" floppy? Or 100M Zip drive? Larry Pierce: About using flash memory for archive backup: Don't! When not used, flash memory loses it's bits over time just like a battery loses charge over time. It may not be worn out, but in 10+ years of not being used (to pick a random time) it will not be readable. Magnetic storage is more stable, albeit not as stable as properly kept optical storage. As a matter of interest how long do commercially produced dvds/blu-rays last? Will I still be able to watch my film collection in 20 years time? I've given up on CD's and DVD's altogether. Put everything on a NAS and back up the data to secondary storage. Data CD's, Music CD's, Video DVD's - everything is being ripped to the NAS. I have a few damaged discs and have purchased a CD/DVD resurfacer in the hopes of retrieving those as well. That is good to learn! I had no idea the colors on a CD or DVD had such a short life. My question is about the way the image is read so that it makes the same image. Software changes so much, does that enter this picture, of saving images? I began thinking it might be better to print important photos so they can be seen by future generations. I doubt that a thousand years from now folks wouldn't even know what a DVD is or have the means to read it. Maybe even 20 years from now folks wouldn't know. I know there are some who are younger that don't know what a cassette is. The only way I can see data lasting for a thousand years is to store the data on something dynamic that changes with advances in technology throughout the years. This would be online on the internet and also offline storage in many places like universities around the world and updated once a year. Companies come and go, even Google could go belly-up at some point, so this "Heritage" achieve would have to be maintained by some type of organization supported by governments and private monies. This is the only way I can foresee data lasting over a thousand years. With the massive take up of USB flash drives and SSD and their improving life span, will there be any CD/DVD drives available or being made in 100 years time to read CD/DVDs? Even the most trusted expert indulges in alamist stuff from time. Sure gets your attention. I have CDs going way back and they can still be read. They've been well looked after. I think bb has provided the most pertinent comment. How long do you expect to have a device that will read and interpret what is written on these disks? Short of putting a device to do this into storage alongside the long term media, you could be struggling in 20 or 30 years time. Forget about these long term media and backup to the cloud and to whatever the current proven reliable media is. Copy from old media to new as technology changes. But there is something new: DNA. New Scientist and such carry articles about the idea. DNA has sometimes lasted for tens of thousands of years. The idea is to borrow from nature and encode on DNA. Not only almost indestructable but incredibly tiny. Get all the world's data in a matchbox (or whatever, I'm only guessing). Meanwhile I use Hard Drives. No one has mentioned those, have they? Googling gets some interesting ideas on it but generally I think they're pretty good for off-line, sitting around in the cupboard, long term storage. Until the DNA gets here. I meant 'indestructable' to refer to 'naturally' destroying itself, of course, like the other mediums... not as in destroyed by fire or something. (though I think dna can handle some pretty harsh treatment). Thanks for another interesting article Bob. I will certainly look into getting a drive and burn my own disks. In reply to David about the life of commercial DVDs, my wife bought series 1 of Bones about 8 years ago and now 5 of the 6 disks are unreadable even though they look in good condition and have only been played a few times. Thank you Kerry, that's bad news. You need the device and the media. Every 5 or 6 years, move all important archives to current technology. Regardless, our kids will likely never be able to use our 'electronic version only' copy of our past. Really important stuff (music, books, art, law and history) must be maintained by an publicly trusted and maintained archive facility. Many private, non-profit arts organizations have already lost entire libraries of 8mm and reel to reel audio archives. DVD will be no safer without government sponsored archives. EDITOR'S NOTE: Government sponsored archives??? I don't recall anything about that in the enumerated powers listed in Article I, Section 8 of the U.S. Constitution. Digital, Optical, Bah! The solution is in your first paragraph Bob. "I was looking at a photo of my great-great-grandparents, which was taken in about 1870." 146 years and you can still look at it without some high tech device. Print it on paper. Make paper copies (backup) and distribute them to those who would be interested in having them. Then properly store the prints. Every M-Disc burner for which I could find details such as on Amazon said that the burner was good for XP, Vista, 7 and maybe 8 or even 8.1, but none mentioned Win 10! Why? Mfrs run out of enthusiasm? EDITOR'S NOTE: If it works on W7 or W8, it should work on W10. I have some 100MB zip disks packed away somewhere, that were the be all/ end all long term file storage solution. I appreciate the technology, but in my opinion, cloud storage is the only long term solution that makes sense. M-Disk seems like a great product, but 10 years too late.